All Black lock Jason Eaton will miss at least one match for the Hurricanes after a mystery breach of team protocol put coach Colin Cooper in a sour mood on Thursday. The Hurricanes will play the Western Force in Wellington without their 15-test All Black on Saturday, and while team management would not reveal the nature of the incident, Cooper hinted Eaton could spend longer on the sidelines if others play well in his place. A clearly unimpressed Cooper said Eaton had no cause for complaint as the rule he broke was well known to players. "No new policy, it's always been in, that's why it's disappointing," Cooper said. "The policy's been broken, that's the consequence, it costs you your jersey." Cooper said the 27-year-old will only miss this week's game "at this stage" but had put his future starting place in jeopardy. "He'll have to sit and wait now. He's given someone else an opportunity." That someone is Canterbury draft selections James Broadhurst, who will make his Super 14 debut in a new-look locking combination. Michael Paterson, who played lock in last week's 34-20 defeat of the Blues, moves to the blindside flank in place of Nick Crosswell, creating room in the second row for Bryn Evans. The match has significance for Evans, 25, who hasn't started a match for seven months since undergoing surgery to relieve a disc prolapse to his back. The timing of the injury was disastrous for the Hawke's Bay leaper, who was a surprise All Blacks selection in June and made two test appearances off the reserve bench against France. "It's been a long road back with all the rehab. The physios have done a great job and I'm feeling nearly back to full fitness," Evans said. "I had a lot of pain down the side of my leg so that's gone away. It's a pretty positive outcome." Evans took a philosophical attitude to the injury and said he would simply do his utmost to impress, whether it's in a starting role for the Hurricanes or off the bench, where he spent ample time last season behind Eaton and Jeremy Thrush. "You're playing a contact sport, injury is just one of those things that happens that you put down to bad luck. It was unfortunate, the timing of the thing. The trainers have been pushing me hard and I'm just happy to be back in the team environment." The team's other change comes out wide, where David Smith comes onto the left wing for gamebreaking Hosea Gear, who is sidelined for at least a month after undergoing surgery this morning on a knee cartilage tear. Cooper said Gear, who scored his team's only try against the Blues, was very disappointed after a knee injury ruled him out of the second half of last year's campaign. A newcomer to the reserve bench is veteran All Blacks No 8 Rodney So'oialo, who missed selection last week while still undergoing a weight-gain regime. 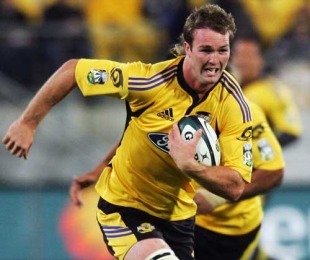 Centre Conrad Smith will play his 50th match for the Hurricanes.